Finding the right location for your first coffee shop business is usually a make or break decision. Choose the right location and you could end up with a thriving business that can be passed down to your children. Choose wrong and you could lose everything financially. No pressure! This is the situation the Reynolds family found themselves in when they started looking for their first location. The family had no experience managing or growing any type of business, much less a coffee business. They needed to make the right choice on location because they might not get a second chance. In order to raise the capital needed for their first location, the family took a loan against their house to fund the first location. It was a massive risk, but decision paid off. 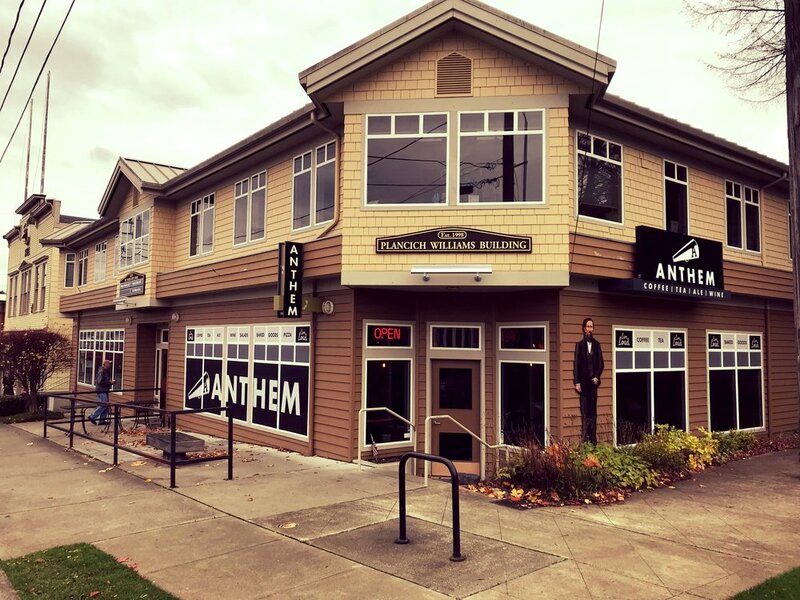 Anthem Coffee & Tea eventually grew to six locations serving the Tacoma area with more scheduled to open this year. Click here to learn the full story of how the Reynold’s family started their coffee business if you missed part one of the series. Click play on the video below to learn the different options that are available to you to finding the critical first location for your coffee business. Before starting the search for your first location, Bryan Reynolds recommends investing time into getting your brand vision, goals, and business plan established. You can find more training videos and coffee shop startup worksheets when you join the private coffee shop startup community for free here. What Are the Size Requirements For a Coffee Shop? Should You Look for a Location with a Drive-Thru? Cafe Takeover: Should You Buy an Existing Coffee Shop? When it’s time to start looking for a location, you’ll need to reach out to commercial real estate agent that’s local to your area. A commercial real estate agent will be able to show you the location options that are available in your desired areas of town. Any good commercial real estate agent will have a deep understanding of the different commercial locations, the local demographics, and costs of different venues around the city. Find someone that is willing to show you around some of the different locations and explain the advantages / disadvantages of each property. It’s important to find an agent that will actually listen to the dreams and hopes you have for your coffee shop so that they will find and show you locations that are in your companies best interest. You can start this search by tapping into your local network, especially someone that owns a successful local business since they will likely have connections with these people. If you don’t know anyone that owns a local business you can start by heading to Google and searching for commercial real estate agents in your area. If there’s a location you already have in mind, you can typically find the contact information of the property management company on a sign outside a strip mall or shopping center. This is another excellent way to inquire about pricing and availability. How to Find a Profitable Coffee Shop Location. When it comes to commercial real estate the properties are graded on a rating system from A (in theory these are the best and most high-traffic locations) to C (the less attractive spaces due to location, resident demographics and traffic). You can learn more about the details of these Class A, Class B, and Class C ratings in this post. When you start looking for your own location, keep in mind that just because something is in an A location doesn’t mean it is going to be the right location for your coffee shop. In fact, it could be a terrible location. Likewise, a location that’s rated as Class C might actually be the ideal location for you to start your business. Bryan’s story does an excellent job explaining why you shouldn’t blindly follow the advise of a commercial real estate professional for your small business. Serious About Starting a Coffee Shop? Join Our Private Coffee Shop Community Here for Free. When Bryan’s family got started in the coffee business they visited three different locations to determine if it was the right fit. Two of the locations visited where graded as Class A. One of the three locations was considered Class C.
The first Class A location visited by the Reynold’s family was a Class A property inside of a chain grocery store. This was a very popular grocery store with a lot of foot traffic in a popular shopping area. While it’s certainly justifiable that the location should be considered “Class A” it didn’t fit the vibe that Bryan and his family had envisioned. After all… Who wants to meet up at a grocery store to have a cup of coffee? While there are plenty of coffee chains that do well inside of grocery stores, it’s not the environment that the family wanted for their own business. The Reynolds family visited another Class A location for the second visit of the tour. This property was next to a Best Buy on a very busy four lane road. There were also a handful of small restaurants and shops in that area. As Bryan points out in the video interview, the location looked great on paper. The population density was there, the income profile of the people that lived there was terrific, and the drive-by traffic looked great. But the location didn’t feel right to the family. Finally, the family visited the Class C location property. The Class C location was located underneath a community of apartments / condos. The property was also located across the street from a park and a subway station. Within two blocks of the location was a bank, a fire department, a police department, and a high school. Despite these elements of a thriving coffee shop location, the property was considered to be Class C.
As you see during the video interview, the class C location didn’t have much activity at the time. The area of town was considered to be a slightly run-down area known for antique stores. But Bryan and his family were able to look beyond numbers on a spreadsheet and see the vision of what could be with the location. Increased development was beginning to come into the area and the venue had the right feel based on their vision. 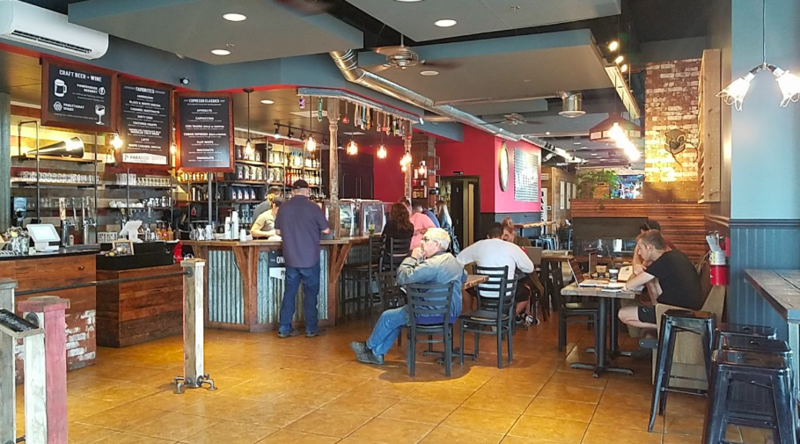 The interior of Anthem Coffee & Tea’s first location in Puyallup, Washington. What was rated a C location became an A+++ location in hindsight. – Bryan Reynolds, Co-Founder / CEO of Anthem Coffee & Tea on selection their first coffee shop location. Even thought the commercial real estate advisors didn’t recommend the Puyallup location, the Reynolds family decided to move forward and open their coffee shop there anyway. Ultimately, this location became the most profitable store for the 27-store coffee shop franchise at the time. Fast forward to the time of this interview, the location now does $1 million+ in gross revenue annually. Not bad for what was considered to be a Class C location in an undesirable area! If you’re wondering what happened to the Class A location next to the Best Buy, it ultimately became a Starbucks franchise and closed down after four years of business. After Starbucks left, it became an ice cream parlor replaced it and also closed down shortly thereafter. Am I willing to go all in, love and serve the people of this community, and is this where I want to put roots down? – Bryan Reynolds, Co-Founder / CEO of Anthem Coffee & Tea on the question you should ask yourself when analyzing a location. The story of the Reynold’s families experience finding their first coffee shop location should not disregard data from property managers or other expert in the field. The demographic data, average income of residents in the area, and proximity to other thriving businesses should be considered in the overall location analysis. Our point in sharing this story is that you shouldn’t look at these numbers in a vacuum. At the end of the day, when you open an independent coffee shop it’s your money that’s on the line. If something doesn’t feel right about a location then keep looking. Outside of the Puyallup Anthem Coffee & Tea location. When designing a floor plan for a coffee house, Bryan does not recommend leasing a location under 1,200 square feet. When you operate a location that falls under this threshold it can be uncomfortable for more than 30 customers inside a cafe. 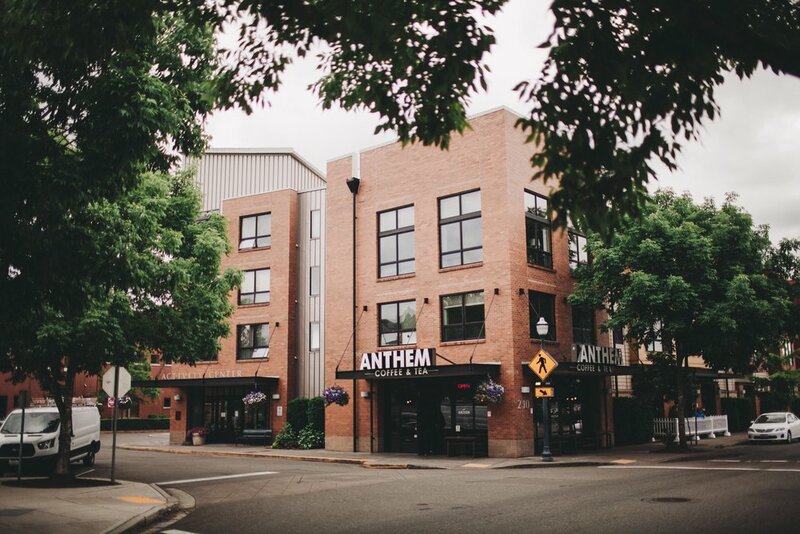 The smallest location of the six locations that Anthem Coffee & Tea operates has a floor plan of 1,300 square feet and comfortably seats 60 guests. A previous guest on the show recommended investing in a coffee shop that has no less than 60 covers (or guests) at one time. The reason for this number is that while a smaller cafe can be profitable, if you want to be able to make enough revenue to a pay full-time manager salary you will need a larger location to generate enough sales to cover employee salaries. If you don’t intend to be an active operator in the coffee business forever then size is a consideration that shouldn’t be overlooked. If you plan to operate the business yourself, then you may not need as large of a space since labor costs will be lower. But you also won’t be able to expand or grow the business if that’s something you want to do by going too small. For this reason, Bryan stresses the importance of understanding your goals before opening the doors to your business. On the flip side, the largest coffee house operated by Anthem Coffee & Tea is a massive 2,800 square foot location. Due to the size, they offer amenities you might not expect at a regular coffee shop such as a conference room that fits 20 people. This conference room is regularly used for classes or meetings. There’s also plenty of room in the lobby to become a destination for events, benefits, or small concerts. With more space, you can offer unique gathering places that draw different groups into the establishment. Outside of the Anthem Coffee & Tea location in Old Town Tacoma. Bryan points out that the 1,200 square foot minimum size for a coffee shop is a good general guideline, but smaller venues can work too depending on your city and personal goals. One example is Laughing Man Coffee Company based in New York. They operate some of their locations in a spaces that aren’t much larger than 400 square feet and are extremely successful. Another popular example is the drive-thru coffee shop that has done well for numerous brands including Better Buzz Coffee based in San Diego. Everywhere in Southern California is known for lots of traffic and spending a lot of time in the car to get to work. As a result, the drive-thru model been extremely successful in this area. It can’t be understated that drive-thru is extremely important for profitability with some coffee businesses. According to Bryan, adding a drive-thru can yield 40% – 60% in extra revenue for some businesses. That’s a staggering number that can be the difference between a runaway success or business failure. Dutch Bros is another terrific example of a brand that is killing it thanks to their drive-thru coffee options. It’s been widely reported that in 2017 alone, the Dutch Bros did $235.7 million in revenue. That’s a lot of coffee and demonstrates the high ceiling for this model! For the next location, Anthem Coffee & Tea plans to test a drive-thru window. There’s no specific reason that Anthem Coffee & Tea has avoided this in the past… It’s simply that their previous locations haven’t made sense or had the option of a drive-thru counter. Depending on where you live and your location this can be a major revenue source for your business. According a to QSR Magazine report, about 70% of revenue goes through quick-serve restaurant drive-thru windows. If you live in a place where people commute regularly this is something that you should seriously consider. You should also ask your commercial real estate agent to view locations that allow a drive-thru option. 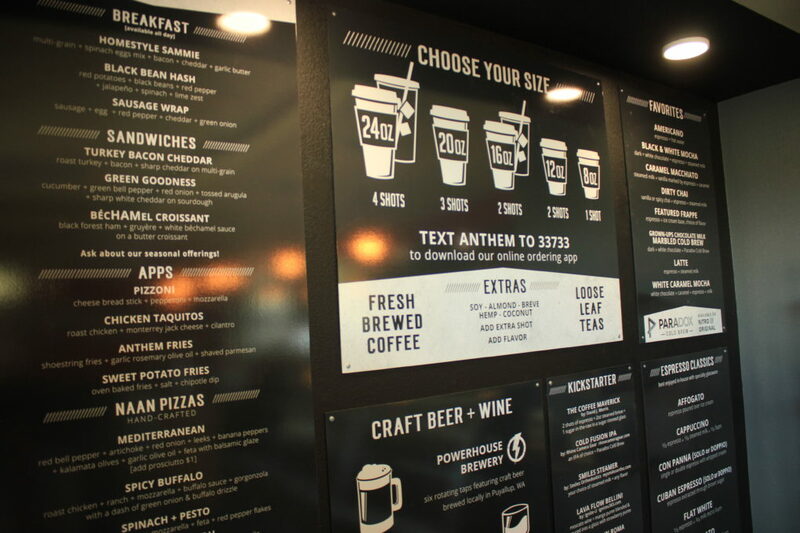 Anthem Coffee & Tea Menu. There are all sorts of reasons people come to your coffee shop. Some are looking for a place they come for a good cup of coffee, strong Wi-Fi connection, and get work done on the laptop. Others are looking for a comfortable place to relax, catch up with friends, and have a conversation. Make sure you create an environment that provides seating options for the the different types of people that will enter your shop. Bar Seating: For customers that come alone or couples that want to belly up to the coffee bar. A good location for customers that want to engage in casual banter with baristas. Seating at the Windows: Similar to bar seats, some customers will like to sit next to a window and flip open their laptops to work. When possible try to provide plenty of electrical outlets for people to power up cell phones and computers. Two Tops / Four Tops Throughout Cafe: Different sized tables help encourage groups of all sizes to meet at your location. Four top tables can be pushed together for larger groups. Couches / Comfortable Seats: The goal of Anthem Coffee & Tea is to be the “living room” of the communities they serve. Depending on the location and size more cushy seats and couches are available. Conference Rooms: You can attract different groups and organizations by offering a conference room. If desired, you can also charge a small fee for groups to reserve. This is another great way to attract more people to your business. Small Stage: While not technically seating, it can be helpful to have a small stage if you want to have small concerts or live events at your venue. When no acts are on stage, you can add additional seating so the space is never going to waste. Another option to consider when looking for your own location is taking over an existing coffee shop business. In fact, three out of the last four coffee shops started by Anthem Coffee & Tea were acquired by buying the business of an existing shop. There are a lot of advantages to buying an existing coffee shop from a business perspective. First is that it takes a lot of time and money to get a commercial space converted into a fully-functioning coffee shop. There are all sorts of costs to outfit a coffee shop: plumbing hook up, electrical setup, cabinets, and permits are just the tip of the iceberg. When you buy an existing coffee shop, the foundational requirements are already taken care of. You’ll almost certainly need to make some updates or changes to the existing coffee shop when you take it over, but you’ll probably be able to use many of the business assets too. In addition to the building foundation, you’ll be buying a business with an existing customer base. Even if the customer base is small at the time of purchase, you won’t be staring from zero as you would be when opening up a brand new location. 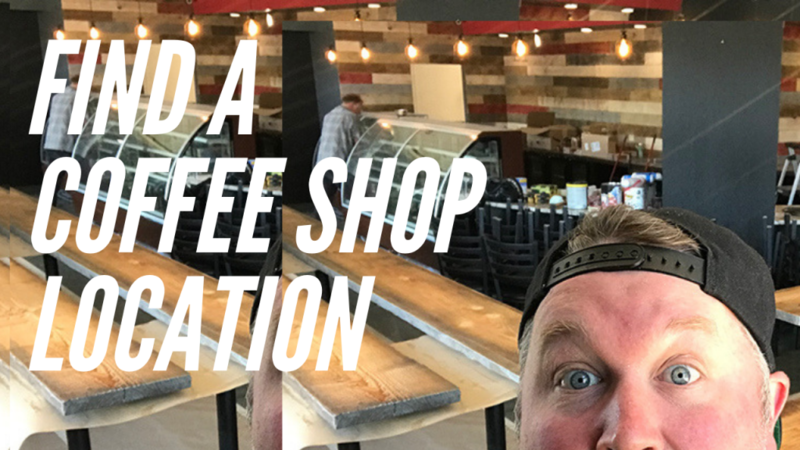 If you ever have the opportunity to step into an existing coffee shop, insert your brand that you’re passionate about, really get out there and infiltrate the community that would be the way to do it. – Bryan Reynolds on the advantages of buying an existing coffee shop. Anthem Coffee & Tea Brand Logo. Are there other complimentary businesses in the location? Are there schools, churches, community centers or places of work nearby the venue? Is there public transportation nearby? Buses, train stations? Is this an up-and-coming area or is it in decline? If new construction or other investment is planned for the future that’s a positive. How much monthly revenue will you need to make to be able to break-even at a specific location due to the lease payments? How many square feet does the location have? Is it large enough to meet your needs? Is there the option to add drive-thru window sales at this location? Can you see yourself serving this community? Is this somewhere you want to put down roots and work everyday? We hope this in-depth piece will help you make the right decision about your first coffee shop location. If you want to learn more about starting a coffee business, join our free startup community here.